Hate to sort laundry? Me, too. Frankly, it just isn't something I've ever wanted to do. But do it we must, right? 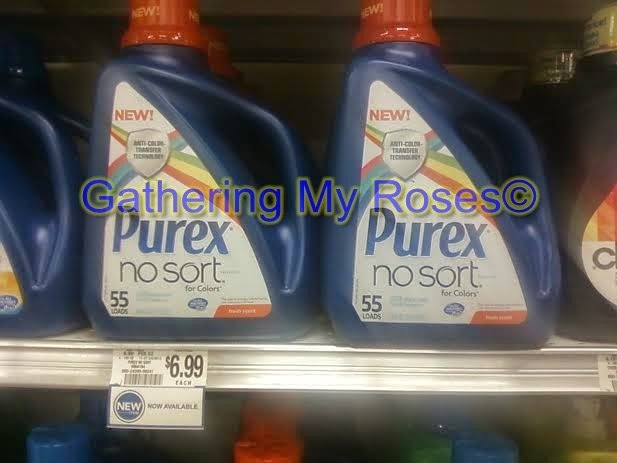 With new Purex No Sort, you don't have to sort! Really! This is just the time-saving innovation for which I've been waiting. The new Anti-Color Transfer Technology keeps dyes from transferring to other fabrics, leaves clothes fresh, bright, and clean, and helps to avoid making extra loads! 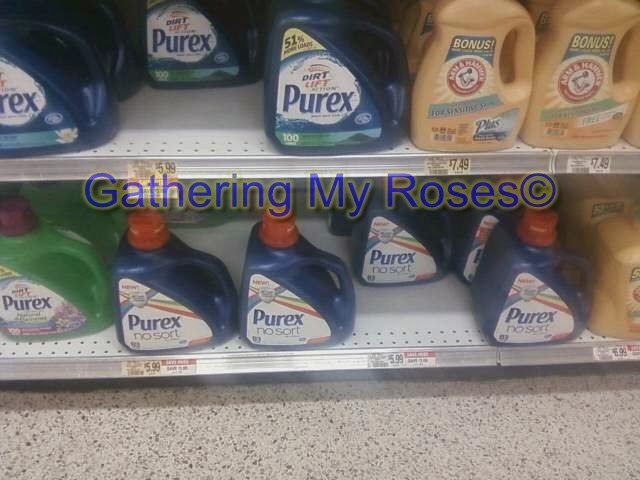 I was a bit concerned that I might not find the Purex No Sort in my store as it's so new, but I was wrong. I found it quite easily on the shelf and in a couple of different sizes, too. In a stroke of good luck, I was able to purchase the larger 83 Load Bottle for less than the 55 Load! WIN! I won again when I took a couple of loads to wash. No sorting. Mike's clothes and my own together again. A few lights and darks tossed together as well as some white clothes. I must admit a slight hesitation, but I did it! The results? Perfect as always! Purex has never let me down! 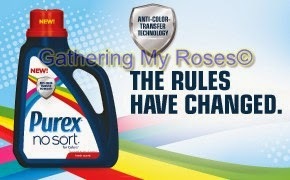 The Rules Have Changed with NEW Purex® No Sort™ for Colors Detergent Sweepstakes! @Purex on Twitter, Facebook, YouTube, Google+, and Pinterest! I use their laundry detergent and crystals every time I do laundry. I have not tried the dryer sheets so that is my next to try. I'd like to try the Purex Crystals. Hello! I use Purex liquid detergent now & would love to try the Purex Crystals. It's neat how you can just put them in the washer. Thanks! I want to try the Mountain Breeze dryer sheets. I'd also like to try the purex crystals for baby. I would love to try the Purex Crystals. I've been wanting to try the Limited Edition Purex Crystals but I haven't found them at a store yet. I would love to try the Mountain Breeze dryer sheets. I would like to try the Purex Fabric Softener Dryer Sheets-- Sweet Lavender fragrance. I have never tried them and think they would smell wonderful. I would love to try the new Purex Crystals Dryer Sheets. I'm sure they work great and leave your clothes smelling fresh. I'd like to try the limited edition crystals! I love their products .I want to try the Limited Edition crystals. We have been using Purex for many years, but I would like to try the Sweet Lavender & Cotton Ultra Purex Regular Fabric Softener. I'd like to try Purex Crystals for Baby. I would love to try the Crystals. I have not yet done so! I have heard favorable opinions of it. I think I am going to try them soon. My clothes always come out staticy. I hate this because I own two dogs (one black and one white). I would love to try the Purex Dryer Sheets with Crystals. These seem like they could help my issue. I would like to try the Purex Crystals. I would like to try Purex plus Oxi next. I'd love to try the purex crystals! Visit PUREX and tell me another product that you'd like to try! 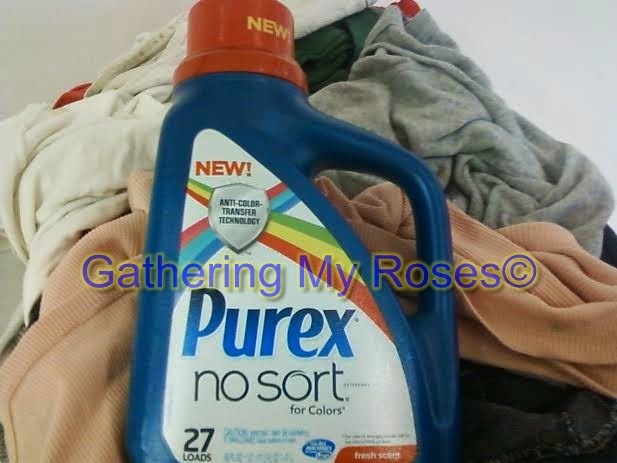 I love purex products it has many awsome scent fragrances and is value for your money. Cross my fingers I win with 4 children I do laundry 3 days out of a week. 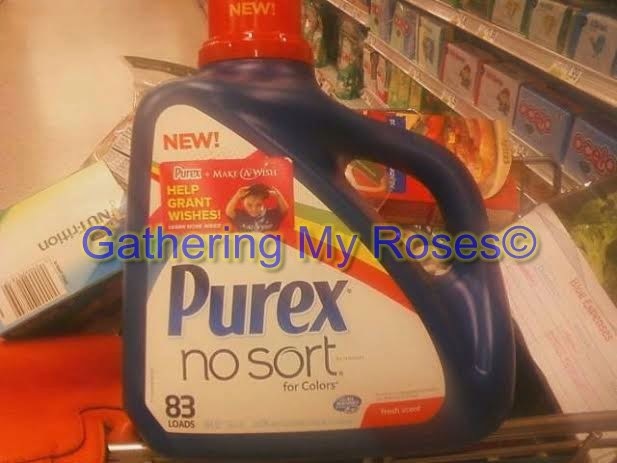 I would like to try the Purex No Sort detergent. I would like to try 5 he Purex Crystals for Baby. I bet they smell great. I'd love to try the purex crystals dryer sheets! I'd like to try the Fels Naptha bar. I would like to try the Fresh Spring Water Purex Crystal! I'd like the Purex cryatals. I'd like to try Purex Laundry Detergent for Baby. I am sure it is fabulous! I would love to try the purex ultraPacks detergent. I would love to try the Tropical Splash Purex Crystals. I want to try the Purex Crystals for Baby...I love the baby detergent from Purex too. I really want to try the Purex crystals! I would also like to try the Crystals. I also entered the earth day glass dharma giveaway! I want to try the new scent from the Crystals! Another product I would like to try is the Purex Crystals Dryer Sheets. i want to try the purex crystals. I'd love to try the Tropical Splash Purex Crystals. Sounds so fresh! I want to try Purex Crystals. I would really like to try the Dryer Sheets! Thanks for the giveaway… we would like to try Purex plus Oxi detergent. I want to try purex dirt lift action.